Basically any weapon type of Staff is viable. The budget choice would be an Ultimate Kalis Staff. Next in line would be a Liverto Staff followed, obviously, by a Kzarka Staff. PRI is fine, DUO is better and TRI is more than enough for any situation. Armor of Choice is a full Grunil Set. While it does not matter how much DP you have if played correctly you should still aim for PRI/DUO just in case you miss a dodge. For Rings, Earrings, Necklace, and Belt the budget version would either be full Jarette’s or full DUO Bares. While Jarette’s can only be aquired through events, DUO Bares is fairly cheap now a days. If you are willing to pay more than that you can go with the two +7 Quest Rewards rings and PRI Witch, TRI Bares Necklace and +0 Tree Spirit Belt / +0 Basilik’s Belt or PRI Shultz. Everything above that would be wasted if you are using your Witch only as Boss alt. In case you have Luck through your titles, your pets or your underwear start switching the Gloves for Magic Attack, followed by the Chest into Cobelinus and last the Boots into Hystria. As like the Equipment Part anything above your simply be overkill. Yes, you could upgrade those Crystals to e.g. Black Magic Crystals or even a Red Battlefield Crystal – Power but what for? There is nothing higher than max. Loot. Again we will go through them one by one! This will increase your overall damage. We don’t need the working or not working Accuracy Buff and we definitely don’t need the +1 Critical Hit. Yet, cheap damage increase – 100% uptime Must Have! This little treasure is one of the reasons in addition to MMA that allows us to get full Loot while running around with a PRI Kalis and Jarette’s Set. +20 Attack is anything we need and combined with the Serendia Meal / Serendia Special we are already on +25 Attack. I highly recommend using the Party Version, not only will your group love you but they are also up for double the time allowing you to kill two fields in a single use. The percentage based damage mitigation on the Valencian Meal / Valencian Special is the real deal. If you just started playing Witch or you don’t feel confident in your reflexes for dodging enemies attacks this is the Food you have been looking for. 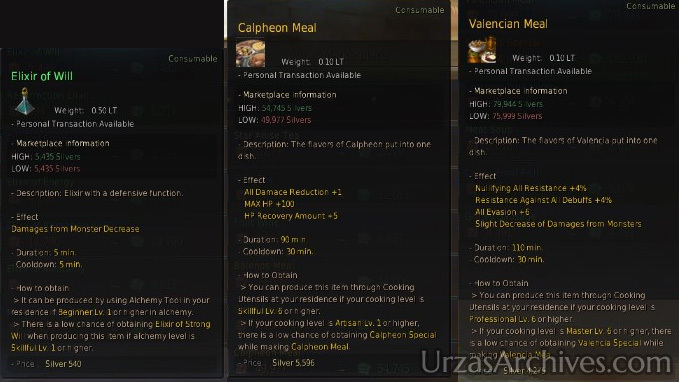 The Calpheon Food will increase you HP and reduce the damage taken slighty. While the Valencian is the stronger choice you are able to combine both for the extra portion of tankiness. 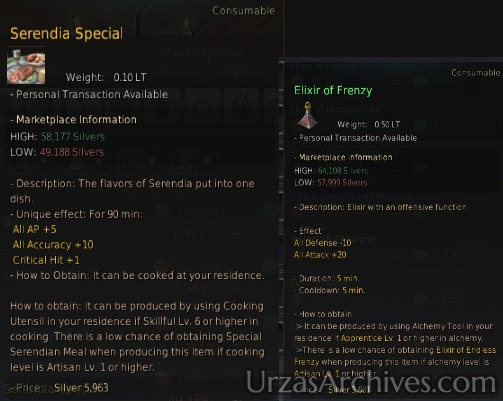 Combining the Elixir of Will with the Valencian Meal / Valencian Special will greatly reduce any damage taken in PvE. Dying with both up is not an easy job! Like the Frenzy I highly recommend using the Party Version of this Elixir as you wouldn’t be able to combine Frenzy with the Will using normal Elixirs.